The effective sterilisation of any material or device to be implanted in or used in close contact with the human body is essential for the elimination of harmful agents such as bacteria. Sterilisation of biomaterials and medical devices reviews established and commonly used technologies alongside new and emerging processes. Following an introduction to the key concepts and challenges involved in sterilisation, the sterilisation of biomaterials and medical devices using steam and dry heat, ionising radiation and ethylene oxide is reviewed. A range of non-traditional sterilisation techniques, such as hydrogen peroxide gas plasma, ozone and steam formaldehyde, is then discussed together with research in sterilisation and decontamination of surfaces by plasma discharges. Sterilisation techniques for polymers, drug-device products and tissue allografts are then reviewed, together with antimicrobial coatings for ‘self-sterilisation’ and the challenge presented by prions and endotoxins in the sterilisation of reusable medical devices. 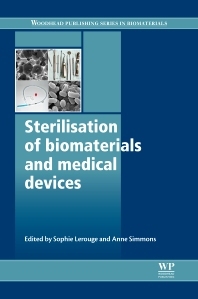 The book concludes with a discussion of future trends in the sterilisation of biomaterials and medical devices. With its distinguished editors and expert team of international contributors, Sterilisation of biomaterials and medical devices is an essential reference for all materials scientists, engineers and researchers within the medical devices industry. It also provides a thorough overview for academics and clinicians working in this area. Sophie Lerouge is Professor of Mechanical Engineering at the École de technologie supérieure, Adjunct Professor in the Department of Radiology at the University of Montreal, and researcher at the University of Montreal Hospital Research Center (CRCHUM), Montreal, Canada. Anne Simmons is Professor of Mechanical and Manufacturing Engineering at the University of New South Wales, Australia.